I haven't read a Starfleet Academy book in quite some time and I've had The Assassination Game sitting on my shelf since it came out! The first thing I noticed about this book was that it is physically thicker than the other books in the series so I immediately thought that that meant more story! Fortunately, I found that there is more story; hurray! The title of The Assassination Game comes from a game that is played in the book in which cadets run around "killing" each other with titanium sporks. However, someone appears to be playing their own real-life version of the Game by setting off dangerous explosions around the campus. I found that The Assassination Game is more exciting than the previous books in the series as the pace of the book moves with the amount of action, which was thankfully not left until the very end. Along with the action, there are also two 'romantic' subplots: one that I thought was clever, and another that makes me want to puke. The clever one involves Bones, the one that makes me want to puke involves Spock and Uhura. The main reason why I don't like the whole relationship between Spock and Uhura in this series is because I have a tendency to base things on The Original Series, even though I know that this series is set in an alternate universe. Spock is pretty much the poster boy for celibacy, so seeing him be in a relationship with Uhura of all people just seems odd to me. However, as I'd said above, I did like the story of Bones' relationship with senior cadet Nadja Luther. Bones is probably the one character who has never really had a love interest (not even in TOS) so it was really good to read about him having one. 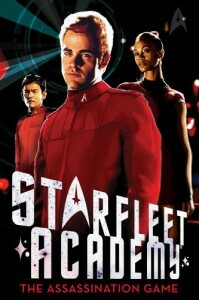 I think that The Assassination Game is the best installation of the Starfleet Academy series so far. This book felt a lot more like Star Trek than the other episodes, but with the added campus mischief. However, the whole Spock and Uhura relationship still makes me feel uneasy. But, they've been written to have things for each other so I can't change that. Oh well.